So the boys decided that they wanted to make their own, but without the noise, a noiseless wind chime if you will. The lovely people from over at Country Baskets sent us a stunning little hamper of craft goodies to get us started and we collected the extra bits we needed along the way. Great idea, have a few friends who work in kindergartens who would love this idea! This is amazing! 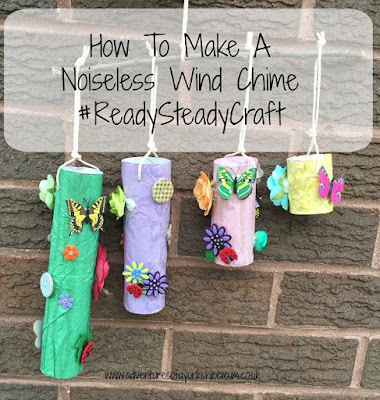 I love the way windchimes look, but I really hate the noise. This is such a fab idea so going to do this with Blake when he is a bit older as he's not interested in crafts yet. That is so pretty - and I love that it makes no noise - who needs chimes in the middle of the night!